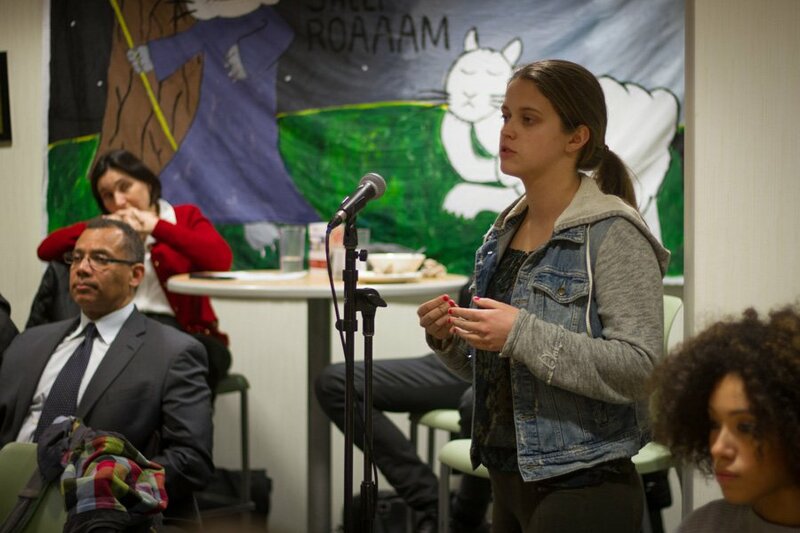 Ashley Wood, ASG vice president for academics, speaks during a community dialogue earlier this month. During the dialogue, students and administrators discussed ways to improve CTECs, such as including questions addressing diversity and inclusion. The University will form two committees to reevaluate CTECs, potentially creating new questions about instructors’ abilities to address questions about diversity and inclusion, a University official said. University Registrar Jacqualyn Casazza said there have been multiple requests from students and faculty to add a “cultural competency” question to course evaluations. One of the committees will focus on core questions for the evaluations, while the second group will focus on the best ways to write effective evaluation questions and use data, Casazza said. She added that the administration had planned to reevaluate course review questions after implementing Blue, a new software platform for the evaluation system, last year. Alison Phillips, senior assistant registrar, said the University hopes to make course reviews more focused on how much and how well students learned as opposed to their general attitude toward a class. Part of that re-focus includes working to include questions of diversity and inclusion in the classroom, she said. “The diversity question is definitely going to be something that is a part of the discussion, because that’s a recommendation that’s been coming from both faculty and students,” Phillips said. After the committees reevaluate and create additional questions to be asked on CTECs, Casazza said she hopes to have a review period for the committees to gather student feedback and address any other concerns. At a community dialogue Feb. 6, Jabbar Bennett, associate provost for diversity and inclusion, responded to a student’s question about adding such a “cultural competency” component to CTECs and said now that the University has implemented a new course evaluation software, it will consider options for including diversity and inclusion in the program. “Now that the platform has been identified, the next thing is to look at the content,” Bennett said. Last Spring Quarter, the platform Blue was implemented across the University following a pilot during Winter Quarter for the School of Communication and the Medill School of Journalism, Media and Integrated Marketing Communications, Phillips said. Prior to Blue, the original CTEC program was written by an Information Technology developer and had been in place for about a decade, Phillips said. The program was difficult to maintain, however, as all of the development and maintenance had to be done by NU. Administrators decided to look into programs by outside vendors that offered more flexibility and additional tools that could be used for course evaluations, Phillips said. Casazza said she is currently in the process of selecting members for the committees who she said will be representative of all backgrounds and disciplines. Each of the two committees will have about 10 to 12 members, she said. Although Casazza said no major changes to CTECs will likely be available in at least the next year, she said this is the first step toward implementing major changes to the system.